Emery Mason hates the holidays. She’s so over tinsel, secret santas, and excessive cheer. To make matter worse, her parents are forcing her to work—as an elf!—in their Santa photo booth at the mall. Then she meets Alejandro Perez, who works at the hot cocoa shop next door. He’s so annoyingly full of the holiday spirit he should be the one wearing elf get-up! But the more time Emery spends with Alex, the more she realizes she might not be the Grinch she thinks she is. When a Secret Santa surprise turns her world upside down, will Emery finally embrace the magic of the season? Or will she miss her chance to kiss the perfect boy under the mistletoe? “Hello,” I said to him, playing up the annoyance in my voice for all it was worth. It was no use. He was still smiling, completely immune. For the last two evenings that I’d worked at the North Pole Wonderland with my parents, Alex had been dauntlessly trying to sway me with different hot cocoa flavors. Tuesday, it was Cinna-more Hot Chocolate, yesterday Pumpkin Perfection, and now this. “Strange. I would’ve pegged you for a zombie type,” he said, unfazed. Zombies were actually way cooler than vampires, but I wasn’t about to admit he’d guessed right. It was strange, the way we’d fallen into this easy banter, especially since we were such complete opposites. I’d actually amped up my snarkiness at first, thinking it would scare him off. If anything, though, it seemed to make him more persistent, which was surprising, a little annoying, but also, I had to grudgingly admit, entertaining. “He didn’t say ‘pointless.’” Alex set my cup behind the counter, then sat down across from me. “He said ‘challenge.’ And I’m up for it.” His eyes stayed on mine longer than I expected, and I felt a confusing flutter in my stomach and dropped my eyes. 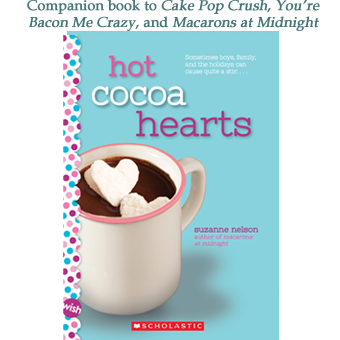 Hot Cocoa Hearts is a companion Book to Cake Pop Crush, You’re Bacon Me Crazy, and Macarons at Midnight.